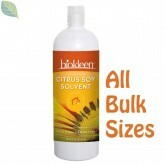 Made with natural, biodegradable ingredients, Biokleen's Natural Glass Cleaner (available here in Large Sizes) is free of ammonia and chlorine and is an ultra effective Glass Cleaners that's also gentle to skin, non-flammable and non-corrosive. Biokleen's Natural Glass Cleaner cleans windows, mirrors and pretty much any other water safe, shiny surfaces, without the worry of toxic fumes or ingredients. And they're regularly used by professional cleaning services and in house maintenance crews for high production work due to the power their vinegar and natural soil lifters which easily dissolve dirt, pollution, smoke, grease and more from glass, mirror and other shiny surfaces. These Natural Glass Cleaners are Non-toxic and very safe to use around pets and plants. Biokleen Glass Cleaners are Ready to Use (RTU) products. Do not dilute. Use to fill automobile window washer reservoirs in warmer months. Product will freeze at low temps, but you can try adding isopropy alcohol to decrease freezing temp of product. Note: Adding alcohol to washer reserviore may shorten the life of some pump seals, so use with caution.